Ignore all original rules regarding Technology, Flagships, Salvage Vessels, and Space Stations. Use rules in this section instead. Remove the following Technology cards from the game: Collapsium Hulls, Xenon Lasers, Plasma Thrusters, Precursor Seed. Remove the following Aliens and form a Minor Alien deck from them: Amoeba, Animal, Bully, Bulwark, Citadel, Cloak, Coordinator, Cryo, Daredevil, Dictator, Fido, Filth, Fodder, Gorgon, Grudge, Grumpus, Guerilla, Hacker. Human, Lightning, Locust, Lunatic, Mirage, Mouth, Neighbor, Outlaw, Patriot, Philantropist, Pirate, Poison, Porcupine, Quartermaster, Remote, Scavenger, Skeptic, Sloth, Sniveler, Sting, Tripler, Void, Vox, Voyager, Whirligig, Yin-Yang. Give each player one Advancement Sheet. Shuffle the Technology and the Space Station decks. Each advancement on the Advancement Sheet represent new abilities that players can develop during the game. Each advancement has an effect and a cost. Cost represents how many ships on it are required to develop the Advancement. Take one of his or her ships from any of the player's colonies and move it to any advancement on the Advancement Sheet. Take one of his or her ships from any Advancement and move it to any other Advancement. Return any number of his or her ships from the Advancement Sheet to any of his or her colonies. Complete any Advancement that has the required number of ships on it. When a player completes an Advancement, he or she places a cosmic token over its cost to indicate the Advancement is now in effect. The player also returns all ships from that Advancement to any of his or her colonies. Ships assigned to an Advcancement are considered to be in that player’s home system, but may not participate in any encounters. Players may not aim the hyperspace gate at the Advancement Sheet, but ships can be lost from the Sheet in other ways (such as the Shadow’s power). A player can take his first Technology (Tech) card on the same Start Turn Phase he or she developed the advancement. When a player gains a Tech card, it is placed facedown in front of him or her, and is not considered part of his or her hand. Until there are enough ships on the Tech card, it is treated as another (unfinished) Advancement. Unlike other Advancements, Tech cards can be completed at any moment, provided enough ships are present on the card. Once a Tech card is discarded, place it on the bottom of the Technology deck. If you complete this Advancement while having lost your alien power, you immediately regain your power. Your saved ship coexists with any ships that establish a colony on the planet during encounters. When this Advancement is completed, the player draws one space station card and places it face up in front of him or her. The player then takes the space station marker that corresponds to his space station card and places the marker so it fits snugly against one of his or her planets. This space station is now attached to that planet. A player without any planets cannot complete the space station Advancement. Each player may only have one space station. Each space station has a special ability that can impact the game as described on the space station's corresponding card. Space station abilities are not considered alien powers. They are not affected by game effects that copy, steal, or cancel alien powers, such as Cosmic Zap. 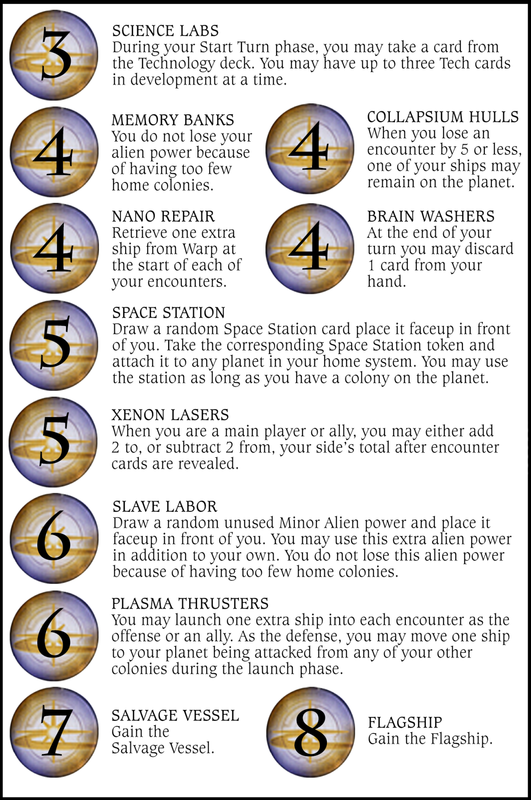 As long as a player maintains a colony on the planet with the attached space station (i.e., he has at least one ship of his color on that planet) the player receives the benefit or has access to the ability listed on his corresponding space station card. The planet to which a space station is attached does not have to be involved in an encounter in order for the player to use his space station’s ability. If a player has no ships on the planet that is attached to his space station, he loses access to his space station ability and flips his corresponding space station card facedown. If a planet with an attached space station is destroyed or otherwise removed from the game for any reason, the attached space station is also destroyed and removed from the game. The player then removes the cosmic token from the space station Advancement and is free to develop a new space station from scratch. If the Minor Alien power has game setup, carry out its effects immediately upon gaining the power. Minor Alien power can be zapped or targeted by other effects normally, but is separate from your basic alien power. Salvage vessel is a ship. When a player creates the Salvage vessel, he must take the marker matching his color and place it on one of his ships with the glowing side up. A player without any ships cannot complete the Salvage vessel Advancement. Using Salvage vessel's game effects requires having control of that ship (not in the warp, not captured, etc.). When a main player or ally has his or her salvage vessel in an encounter, after winning the encounter he or she may either receive two rewards, or draw two tech cards from the tech deck (if in use) and choose one to keep. This is in addition to any other benefits received for winning. Special action - Tractor beam: A player’s salvage vessel may interrupt play to retrieve the top card from the discard pile. Ship’s owner may activate this effect by flipping the ship marker facedown. Whenever the owner's turn ends, turn the marker faceup again - the special action "recharges" for re-use. A player may only have one Salvage vessel. If a player completes both the Salvage vessel and the Flagship, his "marker" ship has abilities and characteristics of both ships. Once any special action of the ship is used, the marker is flipped facedown and no addtional actions can be used until the marker is recharged. When a player creates the Flagship, he must take the marker matching his color and place it on one of his ships with the glowing side up. A player without any ships cannot complete the Flagship Advancement. Using Flagship's game effects requires having control of that ship (not in the warp, not captured, etc.). When a main player or ally has his or her Flagship in an encounter, after encounter cards are revealed he or she may add an extra +3 to his or her side’s total. Special action - Hyperspace drive: A player’s flagship may interrupt play to move to one of his or her colonies, to one of his or her tech cards being researched, or into an encounter in which he or she is involved (ignoring hyperspace gate limits). Ship’s owner may activate this effect by flipping the ship marker facedown. Whenever the owner's turn ends, turn the marker faceup again - the special action "recharges" for re-use. A player may only have one Flagship. If a player completes both the Salvage vessel and the Flagship, his "marker" ship has abilities and characteristics of both ships. Once any special action of the ship is used, the marker is flipped facedown and no addtional actions can be used until the marker is recharged.